Over the Advent season I was responsible for creating the countdown to Christmas day in our church facebook group. I decided to focus on the different names for Jesus. It was an amazing journey for me. I knew the names of Jesus, but seeing many of the compiled into one space was incredible. Counsellor, Prince of Peace and Good Shepherd, are just a few names that show how Jesus is everything I need. 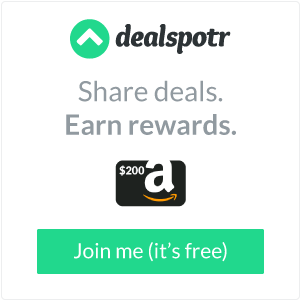 I wish I had the “I Am Devotional – 100 Devotions about the Names of God” while I was creating my list. 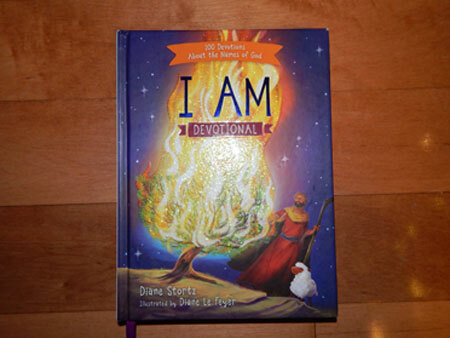 The “I Am Devotional” by Diane Stortz is beautiful devotional about the many descriptive names for God, Jesus and the Holy Spirit that are found in the Bible. The author explores how each name for God tells us something about who he is and how he shows us that he loves us. Each devotional is broken into sections. There is a Banner that shares the name of God in both English and what I believe to be Hebrew. Then it is followed by the title and a scripture verse. The devotional is short, perfect for reading right before bedtime. Each one is written with children in mind, using simple text and descriptions that children can understand. There is a short prayer and discussion question at the end of each devotional, and finally, there is a “Go Deeper” Bible verse to explore. The images included with each devotion are colourful and bright, holding my children’s attention while I’m reading to them. The Book is hard-covered. I like this for a daily devotional as I find they hold up better than paperbacks. There is also an attached ribbon bookmark to help you keep your place each night. The Bible can be confusing to read, especially for new believers. God has many different names and it can often be difficult for little ones to understand that they are all names for God. This devotional helps explain how each different name for God mirrors one of his characteristics. My children hear on communion Sunday’s that Jesus is the “Bread of Life”. This is a concept that is difficult for them to grasp. The author has taken the time to explain how our souls are hungry for a forever life with God, similar to how our bodies are hungry for food. 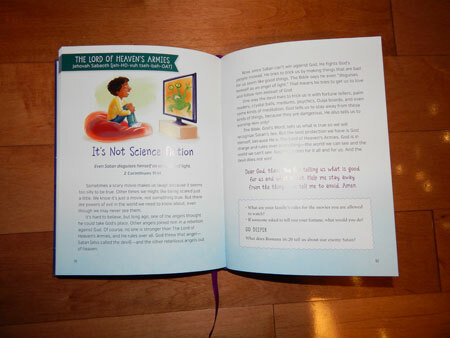 Each devotional is written with children in mind and uses words and concepts that young children can understand. Proverbs 22: 6 says, “Train up a child in the way he should go; even when he is old he will not depart from it.” The “I AM Devotional” contains 100 devotions that will grow your child’s faith and encourage her to grow up strong in God’s word. It is available at most major retail outlets including Tommy Nelson.